With a strong focus through the 25th Mining Indaba on the critical part mining can play in the future of South Africa, and broadly across the rest of the continent, it made sense for the closing day of a very successful Mining Indaba to focus on who will be leading the industry in the future, especially when you consider South Africa has a population skewed towards the young. A mixed young audience including university students, graduates and other professionals were in a fully packed Stage B listening and talking to the Minister of Mineral Resources of South Africa, H.E. Minister Gwede Mantashe from 9:10 AM at the Cape Town International Convention Centre (CTICC). Opening remarks were given by Mr. Alex Grose, the Mining Indaba Managing Director and Ms. Carole Cable from Brunswick. Without any delay, Ms. Hillary Joffe, the moderator, presented a brief but rich biography of the Minister – a former unionist and chair of the Communist party in South Africa. The speakers were reminded that they all were young once as well! Ms Cable started as a scientist and worked in finance before taking a career in the mining sector. She said: “We invite young people to consider a career in the mining sector… there are sustainable careers in mining”. Of importance to today’s session, even people from the church were invited to talk to young leaders about prospects in mining careers. Yesterday delegates were told that Mark Cuttifani, Chief Executive of Anglo American, also started his career when he was 18 years old as an underground miner. Cuttifani said to the audience: “No one ever asked me my opinion on how my job could have been improved back then”. The audience also learned that Mr Mantashe also started young in the mining sector. He said: “I like to talk to young people because I was also young when I joined this sector… I am telling young people today to grab this opportunity to start a career in mining”. In a question and answer session, young leaders asked important questions on skills shortages and the need to prevent excessive retrenchments in the mining sector which make young people fear for the future. To help close the gap of poverty and reduce unemployment, young people have a role to play. Mantashe added: “We need business, labour and governments to collaborate in solving our challenges and helping young people… the mining sector must appreciate that young people come with innovative ideas which must be used as a contribution to economic and industrial drive in the country”. There were sceptics on the impact of new mining technology that could result in job losses in the industr. The minister then advised: “Don’t fear as new technology will help to create different types of new jobs… as the sector is modernising, your qualification is what will give you mobility”. The Minister said the government will do all it can to help, for example, by providing data on mining for entrepreneurs and investors to make things easier. The audience was told that what the industry needs is reskilling and retraining to help deal with the pace of the industrial revolution we now having to face. Skilled and educated staff, including mining engineers and other scientists, are needed in numbers in order to help the industry grow at its maximum rate. As he was finishing his speech, Mr. Mantashe said: “Every country that wants success must invest in education and skilling of its young people… this is what we want to do in South Africa”. 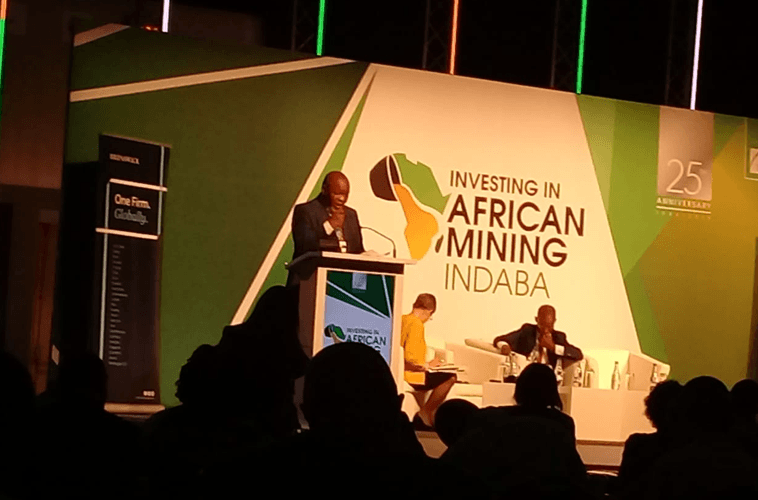 Just as the Indaba started, it ended well, leaving local and international participants with another reason to be optimistic about the future of mining. Dr Elisee Isheloke, PhD, is currently a Postdoctoral Research Fellow working on the Minerals to Metals Initiative in the Department of Chemical Engineering at the University of Cape Town, South Africa. He is writing for MiningIR in a personal capacity.